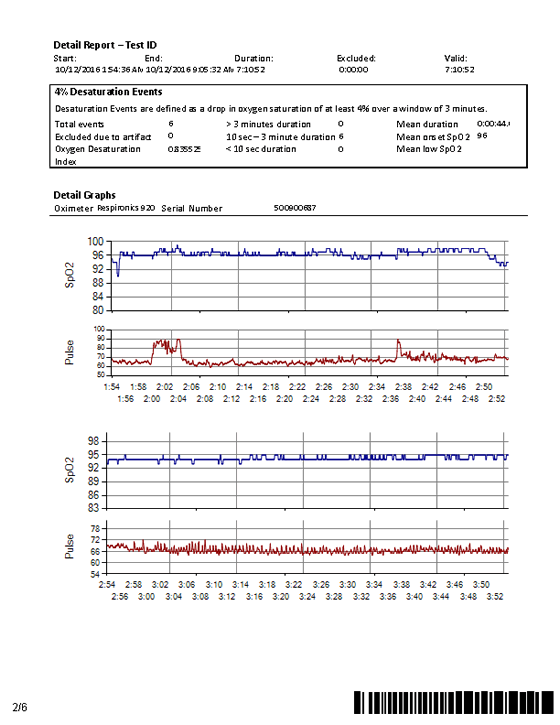 Vitalistics™ overnight oximetry test reports are designed for an easy interpretation and quick diagnosis. Important statistics, patient demographics and Medicare oxygen qualification are organized so that they can be found quickly on the one page comprehensive report. 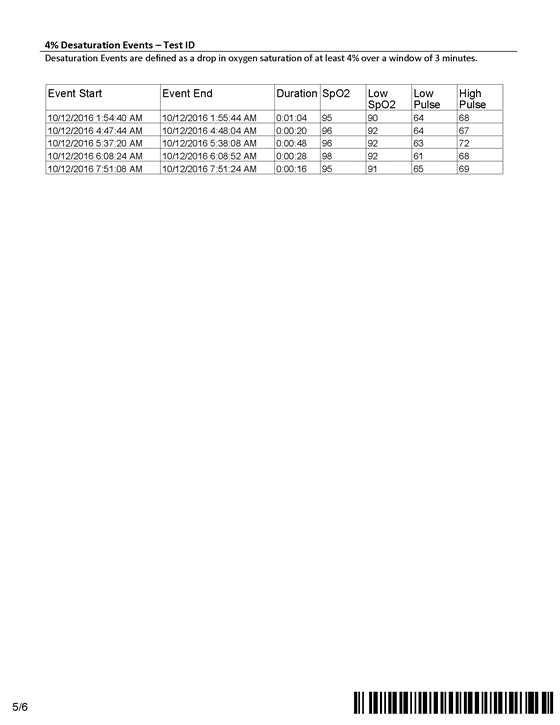 A detailed graphic report, desaturation events chart, and a saturation histogram is also provided for further review. Bar codes are inserted on every page of the report for quick association of the test and patient it belongs to. Single page report containing qualification status, oxygen saturation and a test overview. Contains a summary of 4% desaturation events, and provides multi-color graphs for clear understanding. Report is typically 3-4 pages long depending on duration. This report is helpful when assessing the severity of apneic events. Typically about 5 pages long depending on duration. This report contains a chart of total time for recorded saturation levels, and a graph of SpO2 percentage of total time. This is a great visual aid for patients and physicians to easily see results. Comprehensive Oximetry Test Report: Single page report containing qualification status, oxygen saturation and a test overview. Detailed Report Graphs: Contains a summary of 4% desaturation events, and provides multi-color graphs for clear understanding. Report is typically 3-4 pages long depending on duration. Detailed Desaturation Events Chart: This report is helpful when assessing the severity of apneic events. Typically about 5 pages long depending on duration. 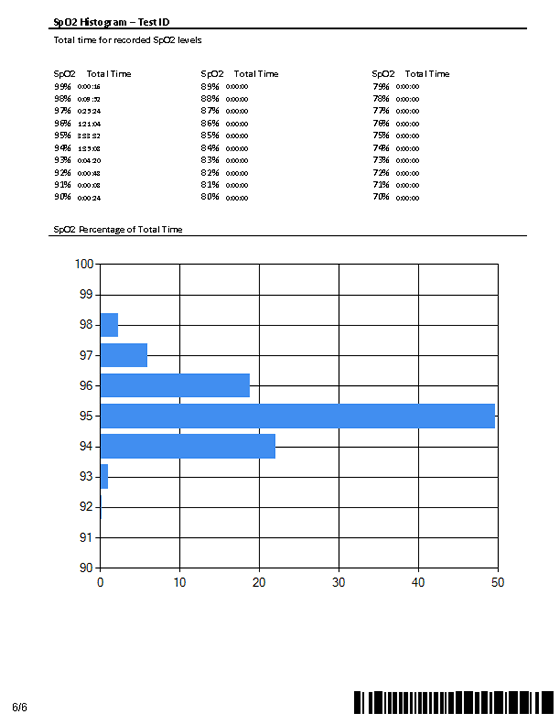 SpO2 Histogram: This report contains a chart of total time for recorded saturation levels, and a graph of SpO2 percentage of total time. This is a great visual aid for patients and physicians to easily see results.